But like, say PCP, salaab is very rare, as it comes only from that one variety of treasured orchid. And it’s illegal to export. I haven’t been able to find it, even in the tiniest and most authentic Middle Eastern markets and bakeries in Massachusetts (and in Iranian hubs in California and Texas). You may have seen boxes like these in those markets. They’re labeled salaab, but they’re really just packages of cornstarch mixed with sugar, gums, and unsettling flavorings. They’re about as potent as they are pure and natural. And they were not going in my ice cream. “Well,” he said. I waited. “Kind of. I mean, no. But I can sell you some.” He went into the kitchen, and returned shouting “$1.99.” The cookie nazi was back. That struck me as dirt-cheap for such a rare ingredient, and I thought it might be fake, until I looked down to see a condiment container, maybe 1/6 full. With no option, I forked over the $1.99. “I don’t know what you’re using this for,” he muttered, “but it’s very strong—not like the Turkish stuff.” Almost offended, as my research lead me to believe they were of equal quality, I said bastani. He violently stuck out his pinkie, and pointed to the very tip. (My dad does this too. Is it a Persian thing?) Ominously he whispered, “Use only this much. That’s it. I use that for gallons of liquid. Any more and…” snap, he clapped his lips together, “…you’ll glue your jaw shut.” “Thanks,” and I grabbed my cup, and walked out as his voice chased me as fast as his broom usually does. “Don’t come back to me with your hospital bill!” I heard. Laughing at his nationalistic comments, I consulted with my friend Sam, who has a stash of Turkish salep for the traditional drink of thickened warm milk; my father (no help there); and some Persian websites, including this absolutely adorable little blog. After spending several hours on Google Translate, I came to my conclusion: silly fool. Well six batches later and no salaab left, it’s clear that I was the real fool. This stuff really is potent. My guess is no more potent that Turkish salep. But when making the drink, one is only briefly stirring. –No Yolks: Although I’m an egg yolk lover, yolks make the ice cream (which is smooth but pleasantly icy and fresh-tasting) too heavy to stretch and too mouth-coatingly smooth. 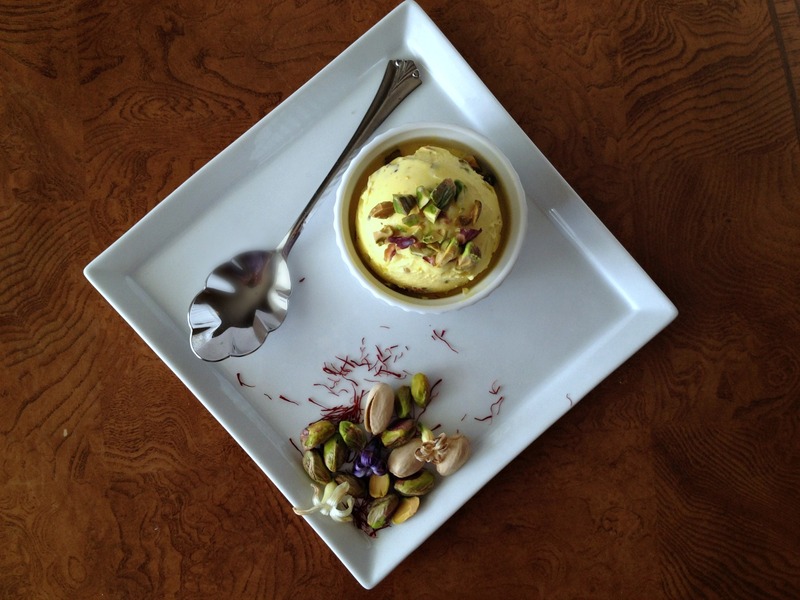 –Milk and Cream: For similar reasons, bastani should be made with equal parts milk and cream, if not more milk than cream. –Sweet and Low: Thick, chewy bastani doesn’t get much air incorporated into it so the volume is stunted. That means more sugar per bite. I use some honey to give the ice cream a floral note, since I prefer to use traditional rose water as just an optional garnish not a flavoring; too much honey, though, and the ice cream will be too smooth. 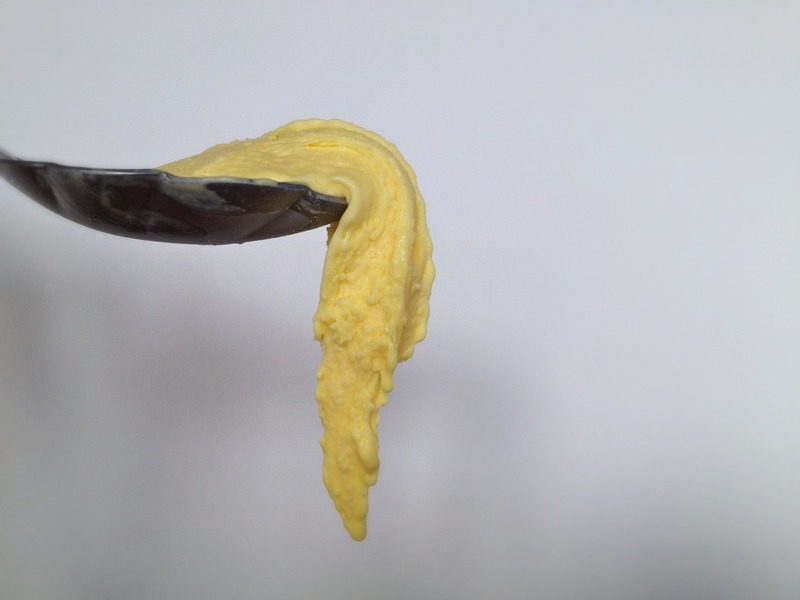 –Salaab Slurry: Make one before incorporating and whisk like mad to prevent lumps. 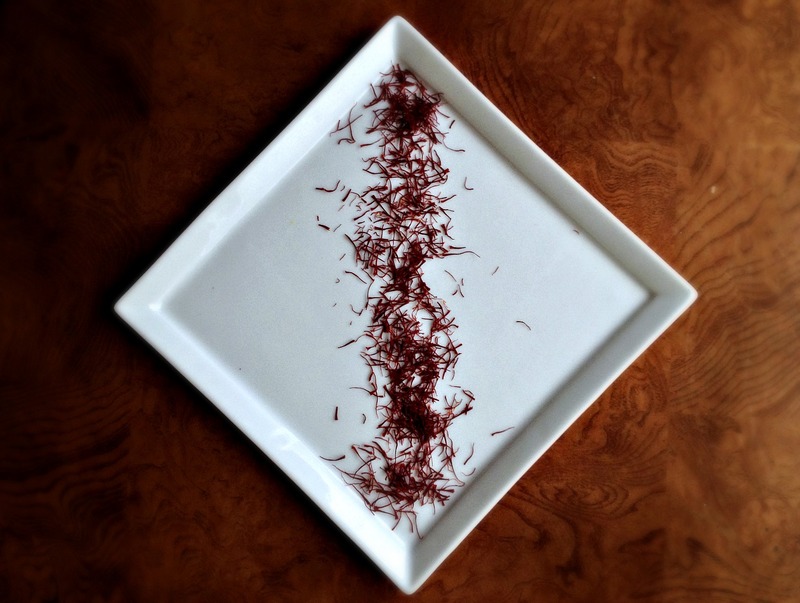 –Use It Sparingly: Let the cooking process make salaab do its thing. The more you cook, the thicker the base will get. Don’t shortcut it with more salaab. If you want to keep your teeth. –Beat It: Beating partially frozen ice cream as it churns promotes stretch, but it cannot melt. I tried transferring churned-then-chilled ice cream to the frozen bowl of a stand mixer, but I could only beat so long before it melted. My solution? The design of my ice cream machine allows me to beat at it as it churns. This promotes stretch and also helps the ultrathick base cycle through the machine. The step is optional but best mirrors what that dude was doing in the video. This can be done by hand outside of the machine as well, but it will need to re-freeze. 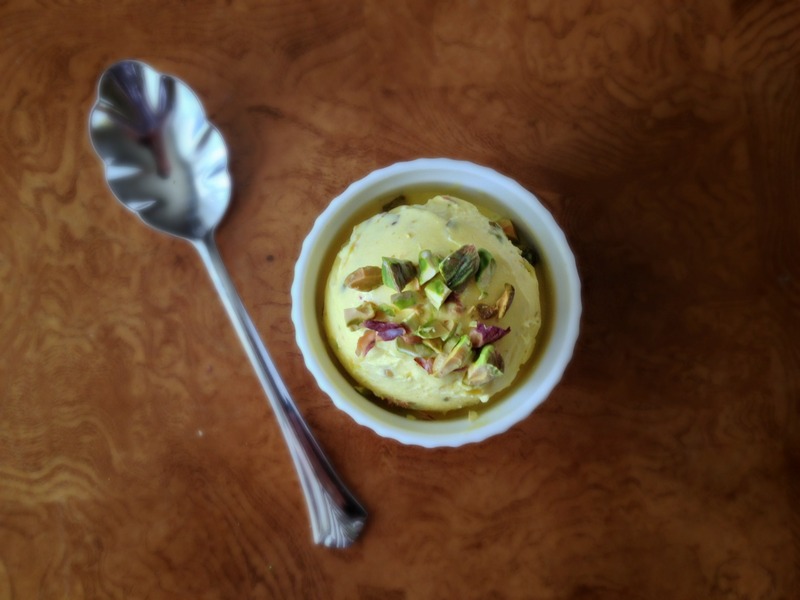 To finish, I added the classic mixins: pistachios, which impart quite a bit of flavor, and shards of frozen heavy cream, which sound strange but which provide a simultaneously icy and creamy neutral break from the saffron base. As I used my last sprinkling of salaab to make batch #6, I knew I didn’t really need to post a recipe for this. Who would make it? It would probably be my first and last time making it myself. But I was satisfied to get just a bit closer to authenticity. I want to record it just to remember that one time. I looked down at my hands and focused on my nails, so yellow from two weeks of staining, and thought about how that color is missing, only pulled out maybe once every two months. Perhaps this ice cream was a reminder of how much world food there is to explore. Or maybe, it was at the very least, a reminder to head out to Watertown and thank Mohammad. An orange blossom honey or a heavily floral-scented honey works well in this ice cream if that’s your thing. 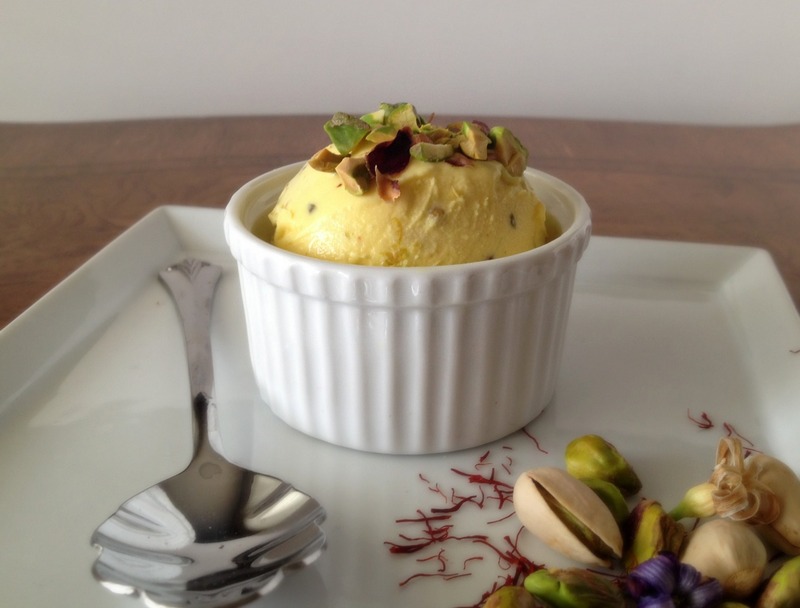 Serve with more chopped pistachios on top or a sprinkle of rosewater if desired. This recipe will not work with cornstarch or imitation salaab. 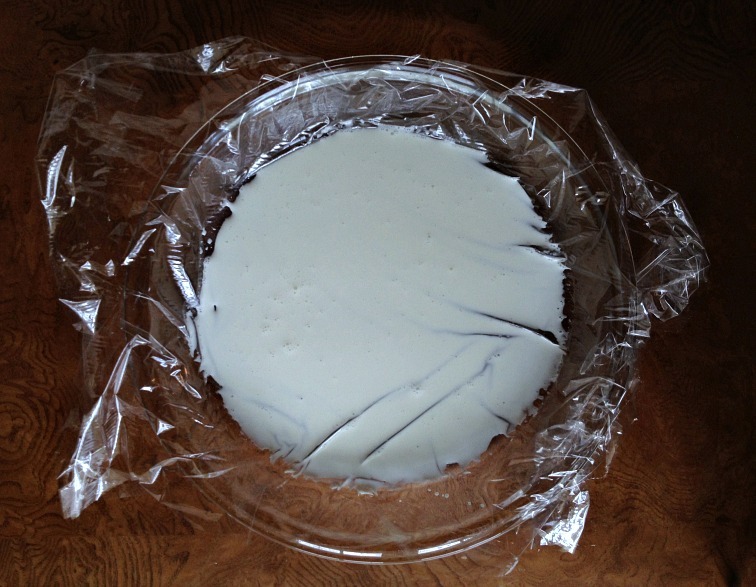 Line 9-inch pie plate with plastic wrap. Pour 55 grams (about 1/4 cup) heavy cream into plate to coat bottom. Transfer plate to freezer to freeze solid, about 2 hours (see above photo). Place remaining heavy cream, 230 grams (1 cup) milk, sugar, honey, and salt in large saucepan and bring to gentle boil over medium heat, whisking occasionally to dissolve sugar. Off heat, add saffron, whisk to release color, cover, and steep for at least 30 minutes and up to 1 hour. Uncover pan, strain cream mixture into bowl through fine-mesh strainer, and return to saucepan. Once again, bring to gentle boil over medium heat. Meanwhile, pour remaining 115 grams (1/2 cup) milk into small bowl. Sift salaab over milk and whisk vigorously to dissolve salaab as much as possible, about 30 seconds. Slowly pour milk mixture into pan in steady stream, whisking constantly to prevent lumps. Bring mixture back to gentle boil (whisking constantly and moderating heat as necessary) and continue to whisk until mixture is thick (it will look a bit thicker than your typical custard base), about 10 minutes. Transfer mixture to bowl set in ice water bath and whisk until mixture reaches about 75 degrees. Cover bowl and refrigerate for at least 4 hours or up to 24 hours. Using plastic wrap, break the frozen cream mixture into chunks and shards. Place ice cream base in ice cream machine and churn, undisturbed, for first 10 minutes. Stick rubber spatula into top hole of ice cream machine and beat at churning ice cream, using an up and down motion. 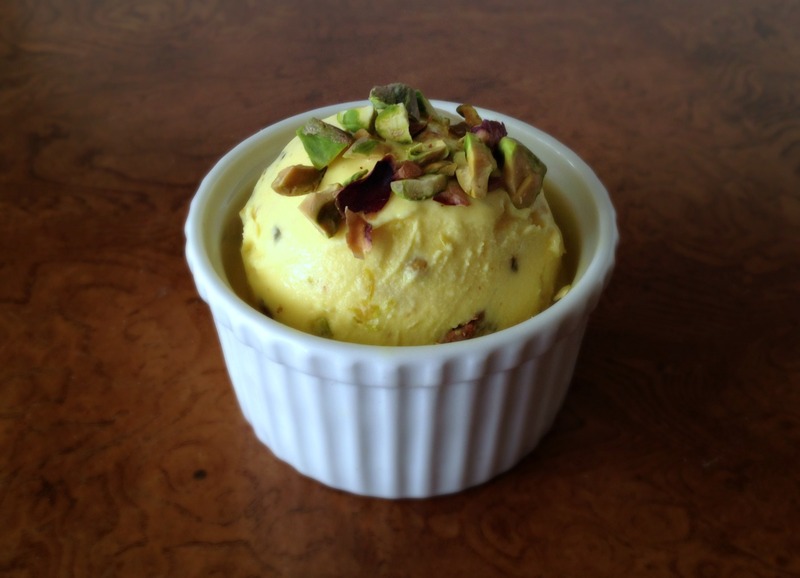 After 20 minutes of churning, fold in pistachios and frozen cream shards and transfer to airtight container. 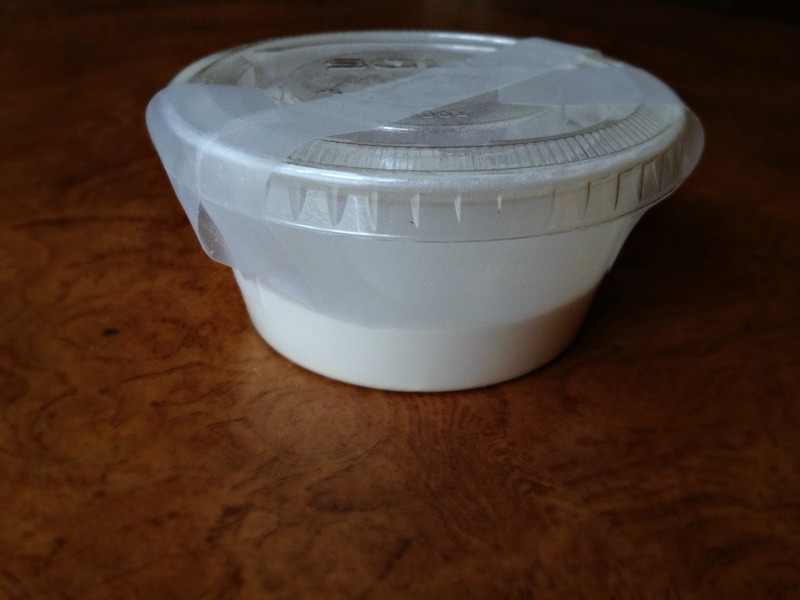 Store in airtight container for at least 3 hours before serving. Fascinating post Sacha. I make a LOT of ice cream but I’ve never heard of or tried this method. It looks really good – the hunt for ingredients begins! Wow, this is intriguing! I would love to try this ice cream one day. It seems like the scent, flavour, and chewiness is something you really can’t imagine till you try it. Thanks for sharing, so beautifully written. I know how hard you worked on this. It looks absolutely beautiful! I am so fascinated by the salaab. Fascinating! And such lovely photos, too. I am in the food industry – you are inspirational. Super cool – cutting edge in my humble opinion.